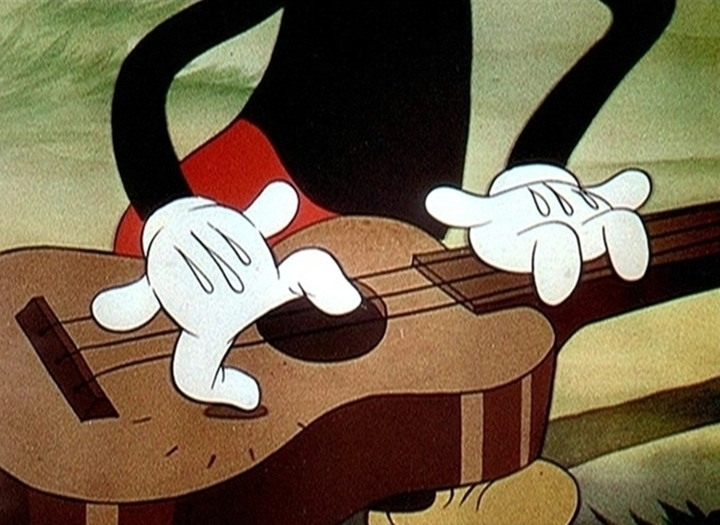 Mickey and Minnie play the uke and dance for a few brief moments - then it's on to the main body of the short as Goofy surfs, Pluto fights with a crab, and Donald sets himself on fire. 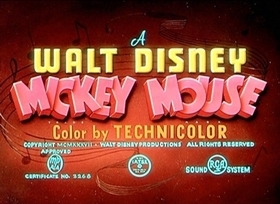 First Disney (and Mickey Mouse) cartoon to be released by RKO Radio Pictures. Goofy sure had a lot of trouble surfing on the sea. Thank God I never have that trouble whenever I go out and surf. I live right by the Pacific Ocean so I can surf just about everyday. This cartoon was not created for an ironic, cynical audience. It is not self-referential. It does not have a subversive message. It is a cartoon that draws on a cultural mythology that has optimism and gentleness at its core. It was intended to be light, it was intended to be amusing, but I don't believe that it was intended to cause uncontrollable belly-laughs. To me Hawaiian Holiday is gorgeous. The backgrounds are insanely lush -- I wanna climb in and lie in a hammock! And the thing that most commenters on this website seem to gloss over is the quality of the movement in the animation. Just look at it. Turn the sound off. Watch it in slow motion. To think that there was once a commercial studio where animators were somehow indoctrinated into a production method that inspired THAT level of quality is almost unbelievable. I also believe that if you are judging any old Disney short by its story, then you are missing the point. The most important thing that I get out of Disney cartoons is cuteness. Where else can I go to get such high doses of cuteness? I'm not saying cuteness is the only important thing in life, but I am saying that if you want it, look at Hawaiian Holiday. And if you want a great story with lots of laughs, watch the Simpsons. In this short, we have five Disney characters (the "Fab Five" as the people on Toon Disney call them): Mickey, Minnie, Donald, Pluto, and Goofy. Each one is doing something. Donald and Minnie are both doing the hula, Mickey is playing on the guitar, Pluto is sniffing the beach getting himself into all sorts of messes, and Goofy is trying to surf on an uncooperating wave. What somewhat interests me is that when this short was released, Hawaii was not yet a state it was still a territory. 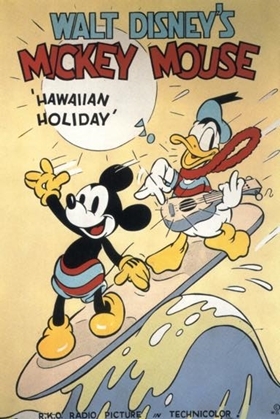 I bet a lot of people who saw this cartoon hadn't been to Hawaii (except for the ones who were watching it in Hawaiian theaters) and probably found it quite interesting, especially with the Disney characters. Summer fun, that's for sure. It's been a long time since I've seen this cartoon, but I still remember the joy I got from watching it. 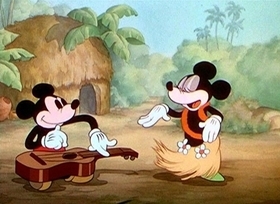 Mickey and the gang (Minnie, Donald, Goofy, and Pluto), otherwise known as the "Fab Five", are on a vacation in Hawaii. Mickey is at the guitar, Minnie and Donald does some hula dances, Goofy does surfing, and Pluto does some sand searching. 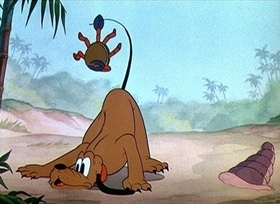 While this IS a Mickey Mouse cartoon, the story is actually focused more on the co-stars, more particularly Goofy and Pluto. 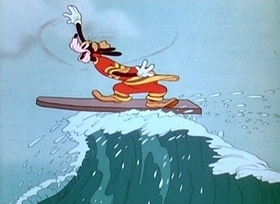 Goofy has trouble surfing, since the waves are uncooperative. 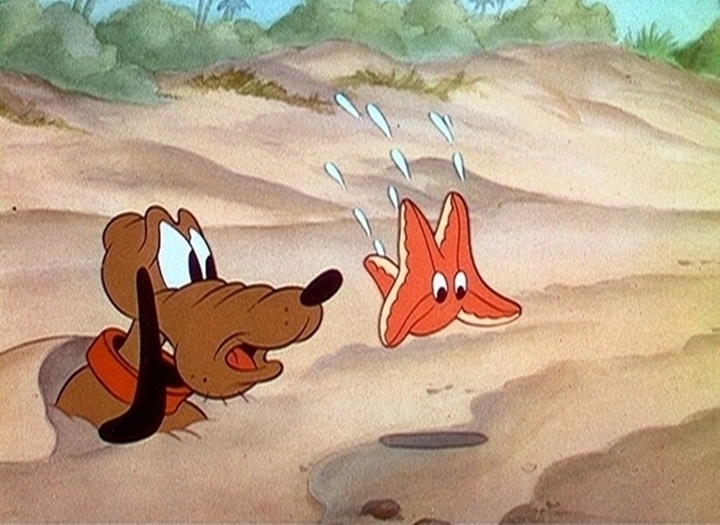 Pluto has trouble with a starfish, a seashell, and finally a crab. We see less of what's going on with Mickey, Minnie, and Donald, although Donald did have a minor accident while dancing. Despite the co-stars' troubles, everything turns out okay in the end. It truly was a Hawaiian Holiday. The stuff I liked in the cartoon was the artwork, plus the music (especially when Pluto and the crab does a mirror dance). I also liked a lot of the gags placed among the characters' conflicts. 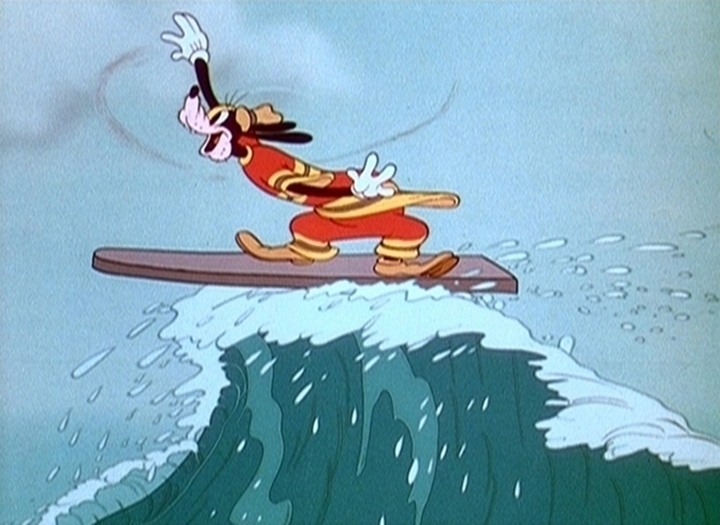 Most of the funniest jokes came from Goofy's attempts to do some surfing. Goofy always has trouble in whatever he plans to do, and they almost always come off with a spectacular comedic showcase. 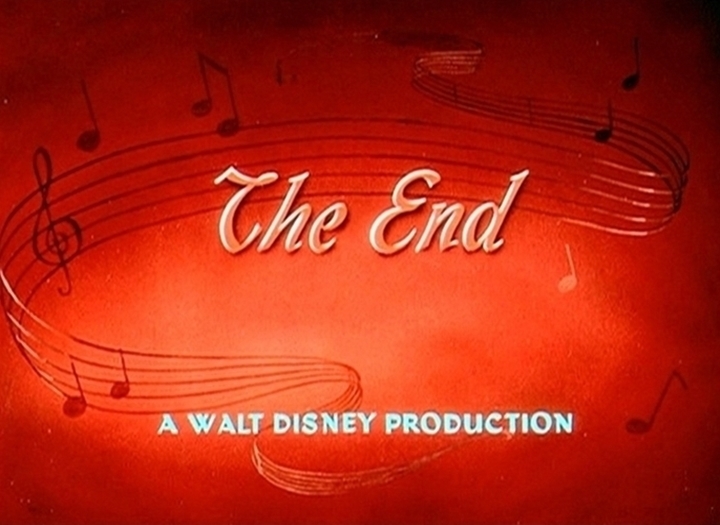 Overall, the art, music, and comedy made it very easy to ignore the story (as is the case in many Disney cartoons). 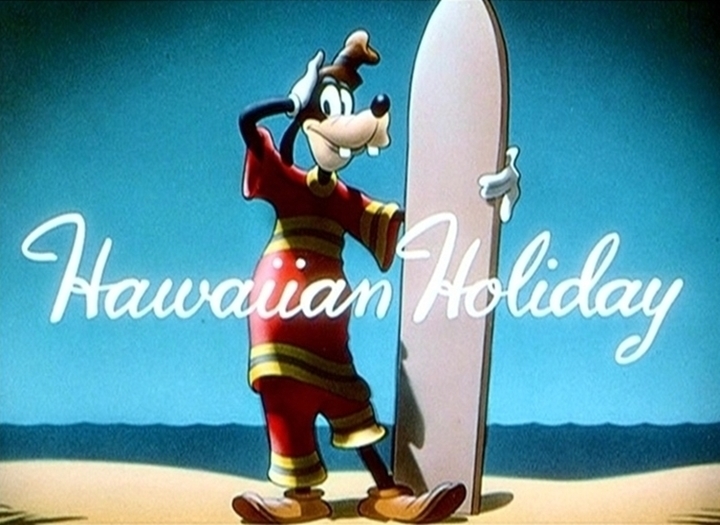 I really enjoyed Hawaiian Holiday, even though the cartoon was made 22 years before Hawaii became part of the Union. ALOHA! In this short, Mickey and the gang enjoy a day at the beach during a Hawaiian vacation. I thought the best scene was the one where Mickey was playing the ukulele while Donald hula dances, eventually setting himself on fire, although the scenes with Goofy attempting to surf were pretty funny as well. 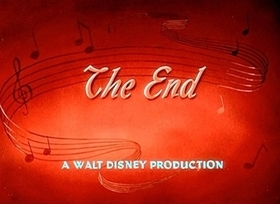 The bits with Pluto in them ran a little long for my taste, but everything else about the short was great. I liked this short for the music and I wonder who did it. My guess is that it's Paul J Smith. A very well animated cartoon from Disney. The backgrounds were beautiful and the music was tops. The best Disney cartoons are with the "originals" who started it all. The Fab Five. The story was typical of the shorts and the gags were plenty. My main complaint from many of the fans who comment or rate the shorts is nitpicking: why would they sell this or that, why would this object be here, etc. These are cartoons made for enjoyment and entertainment. All you need to see is the Disney name and you know you're getting the best. Ah, Hawaii... What better place for the Fab Five to take a vacation to. I found this short absolutely funny despite the fact that it had no particular storyline. Pluto's encounter with the starfish and crab garnered a few laughs, as did Goofy's attempts to surf, but I think the funniest part is where Donald catches his tail feathers on fire. *laughs* I give this one a 10. I just love the music too! 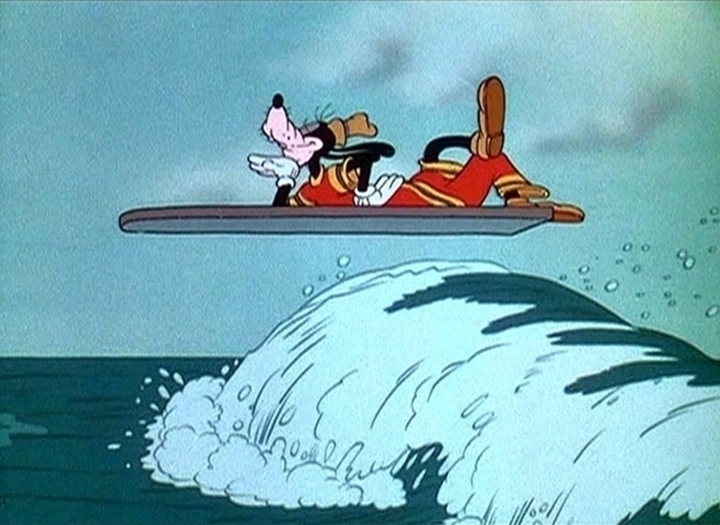 Although the jokes involving Pluto kinda get played out, watching Goofy surf makes this cartoon worth watching. One of my favs and often wondered if the tune Mickey plays is a "real" song or if it was done just for this short? When I first got the tins of Mickey Mouse in Living Color in the Walt Disney Treasures set, I sat down with my son and watched almost all of Disc 1. Our favorite of those early shorts was this one, Hawaiian Holiday. Why? Because it combines all five of Disney’s classic characters in one place, with everyone getting their own little moments. 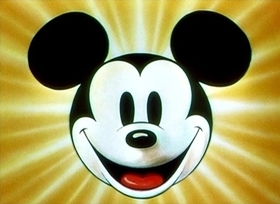 I have another reason – if you follow me on Twitter, you see my icon is Mickey in a hammock. I’m a huge Polynesian Resort fan/Tiki aficionado as well as a Disney nut. A “cel” from this short is hanging next to the elevators on the bottom floor of the Polynesian, and I go on those elevators all the time, going up with a stroller to Kona or ‘Ohana. So, Hawaiian Holiday holds a special place in my heart. In all likelihood, it probably should not do so. This short doesn’t really have a story or a through line, but is mainly a collection of little gags featuring the Fab Five. As per usual, Mickey gets the short end of the stick, but Minnie isn’t far behind. Mickey’s big moment is as a guitar player, where his hands do a dance across the strings, reminiscent of the gloves in Thru the Mirror. Minnie doesn’t get much time to herself, but ends up doing some quick dances at the beginning of the short, and then again in the middle and end. She doesn’t have a gag to herself, per se, but she sets the musical tone of the short by singing the main lyrics of the song that runs throughout. Donald is notably less prevalent in this short than you would expect. He also has one quick gag, where he is dancing in a grass skirt that catches on fire. Despite the brevity, it’s a fun gag that plays well with Donald’s tendency to overreact. The majority of the short, though is taken up by Pluto and Goofy. This follows the typical rule that Pluto can’t be present without taking over a short, but he gets roughly equal screen time with Goofy in Hawaiian Holiday. Here, it’s Pluto taking on a sea shell and then a crab. It’s a repeat gag when he faces off with the crab, mimicking the crab’s movements, but it’s still funny. Goofy’s main gag is a preview of what he will come to be known for – his futile attempts at sports. 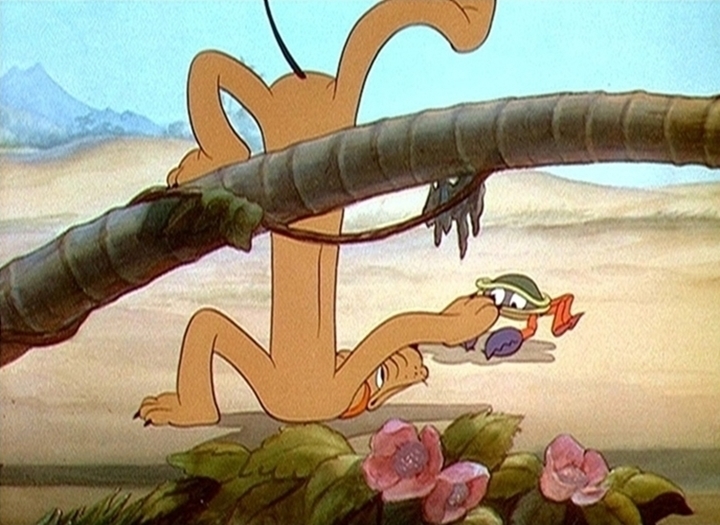 Throughout the short, Goofy is trying to surf, only to be thwarted by the tides, sand and finally the ocean itself. 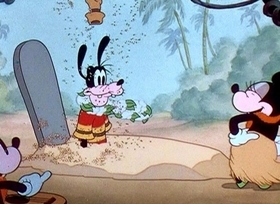 As his solo series evolved, this was what Goofy did best. Marry the contrary narration we saw in Little Hiawatha with this comical attempt by Goofy and you have the shape of Goofy’s solo series. There’s no reason I should like Hawaiian Holiday as much as I do, but I think that’s what is so appealing. It’s not something you would break down for its component parts (story, animation, backgrounds), although all are good. This is a short to simply watch and enjoy, and I do. A whole lot of fun with the Disney gang. This was the first Disney cartoon to be released by RKO and, although I don't know if it was intentional or not, it makes sense that the first cartoon in the contract would be one to feature all five of Disney's main characters. 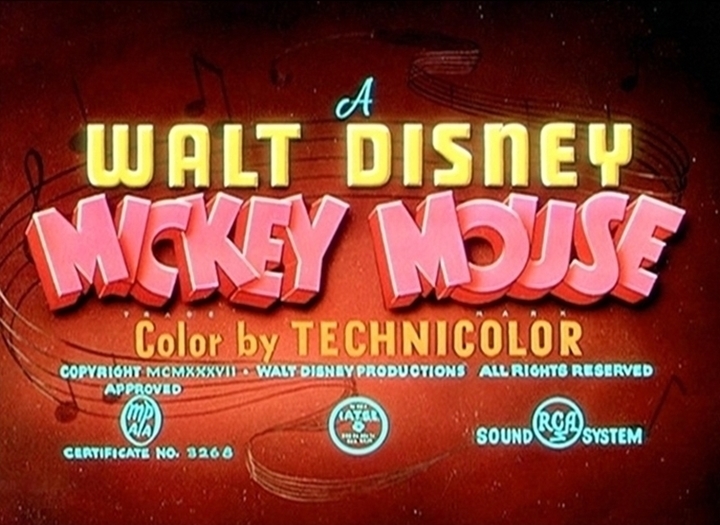 I've never seen the original titles for this cartoon, but I wonder if they were the first to feature the familiar red burlap background we associate with Disney cartoons. I just had to write this in a week featuring 100 degree temperatures! If you want a summer theme, or live around the North or South Pole, this is a perfect cartoon to comment on. The cartoon introduces the scenery where Mickey, Minnie, Donald, Goofy, and Pluto all are relaxing on a peaceful beach of Waikiki. Mickey plays the ukulele while Minnie dances, Donald cools out, and Goofy carries his surfboard into the ocean of personified waves. This is where all the subplots come in. 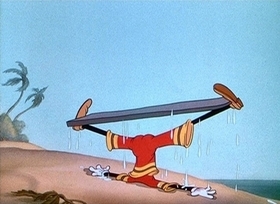 In Goofy's first attempt to surf, the waves put on the brakes and he lands on sand and rock, consequently receiving Excedrin headache number (fill in the blank). The waves come back to swipe Goofy off his feet and carry him while he imitates a log roller before crashing on the beach. 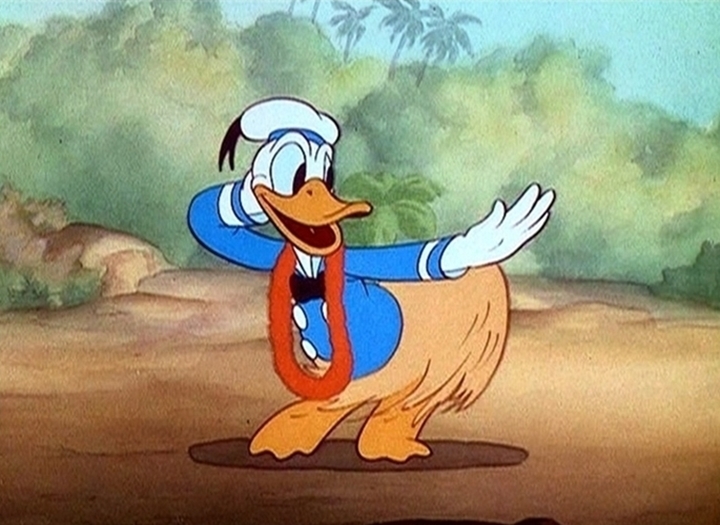 As Mickey continues playing his ukulele, Donald dances only to have his own personal temperature rise about 500 degrees as he gets his own "lu-ouch" in "fanny-burn." (Just wondering: What exactly do you need a pot and a fire for in Hawaii, when it's already tropical outside?) After running to the pond and sitting down for relief, a starfish attaches his hiny, which won't make the burns go away very quickly. However, he manages to get the starfish off in Pluto's direction and the dog starts chasing it until the waves crash on them. The starfish gives Pluto a shot in the nose, and I still don't know what Pluto has done to deserve that treatment. Goofy tries again to surf, and thinking he did so successfully, the waves humanize again and drop, making Goofy go airborne and subsequently crashing into the water, losing his surfboard in the process. As Goofy searches, a wave obliges by giving him the surfboard "back." Or did I mean "up his" back? Goofy lives up to his name by searching for his surfboard when he was already in a very stiff situation. Meanwhile, Pluto sniffs his way into a shell and gets stuck in it thanks to a wave crashing into him. A struggle ensued until he finally gets the shell off very briefly--only to have it land on his behind. Little did he know that a crab was in the stuffed shell and hanging on to Pluto's tail, then carrying Pluto's rear around a little bit before biting him on the nose. After a mirrored dance on the sand, another wave crashes down on them, and the crab takes a hint from the starfish from earlier...honking Pluto on the nose. Goofy tries one more time to surf, and this time he yells to the gang that he knows he has it down. Of course the wave has other plans, physically yanking the surfboard from him, clubbing him on this back, and sending him and the surfboard airborne. Goofy makes a nosedive landing beneath the sand and comes to a crashing stop when the surfboard intersects him. With the surfboard sticking straight up, Goofy had to "rest in pieces" in an aloha-hooey manner. This cartoon dragged out more than I thought it would. Personally, the animators took way too much time dragging out all the comic scenes, especially Pluto's encounter with the starfish and the crab. There were too many drawn-out subplots instead of big laughs, but Goofy clearly is the star of the cartoon since he added a lot of frequent-flyer miles to his resume. Still, it is rare to see five major characters be in the same cartoon, which is certainly a positive for anyone watching.